I’m not a pie maker but I made an exception for this one for a few reasons. It’s easy. It’s no-bake. And I cheated and used a storebought Oreo cookie crust. Don’t hate me because I like shortcuts and easy desserts. You probably do too. 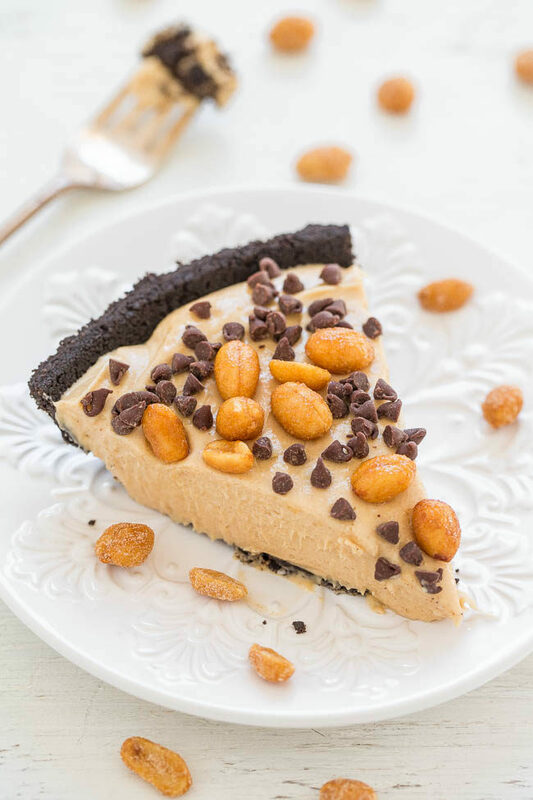 The pie is full of rich peanut butter flavor, it’s salty-and-sweet, and it’s creamy from whipped topping. Oh yes, another shortcut. I love me some Cool Whip. If you don’t have whipped topping in your area or are opposed to using it, this probably isn’t the pie for you. I don’t recommend using real whipped cream because it will deflate and you’ll have a #piefail on your hands. Tangy cream cheese adds another flavor dimension and balances the sweetness from the whipped topping. The smooth filling in contrast with the crunchy Oreo cookie crust is a total win. 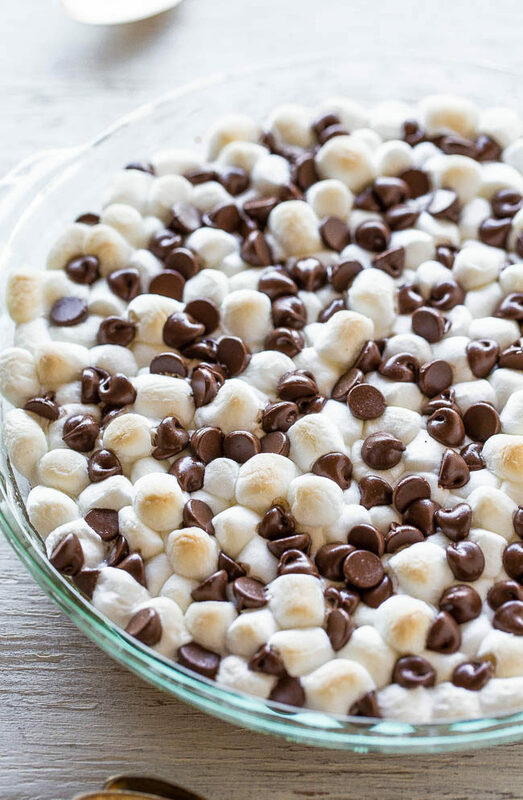 Peanuts and mini chocolate chips sprinkled on top add even more crunch and texture which we loved. I appreciate that this pie is served chilled and love rich desserts like brownies or this pie served chilled. It would be great for (summertime) events because you can make it in advance a couple days in advance, pop it in the fridge, and forget about it. 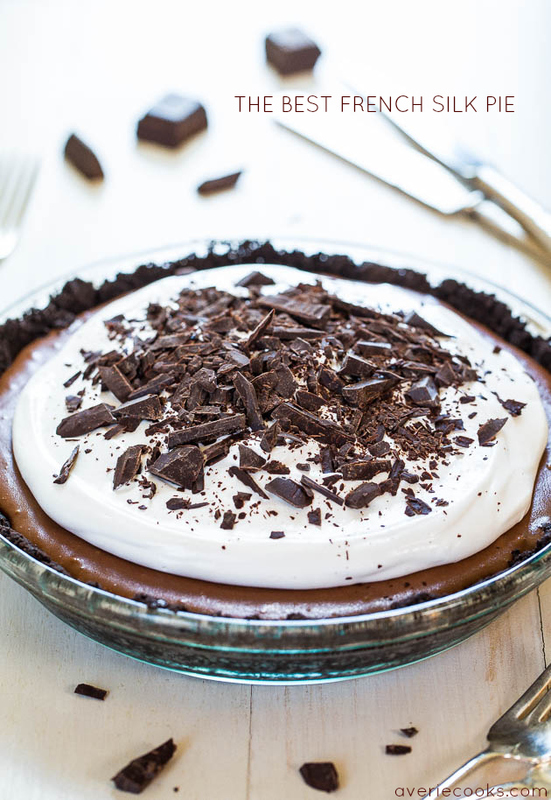 The pie is easy, no-bake, and uses a storebought Oreo cookie crust. It’s full of rich peanut butter flavor and perfectly sweet and creamy from whipped topping. Tangy cream cheese adds another flavor dimension. The smooth filling in contrast with the crunchy Oreo cookie crust is a total win. Mini chocolate chips and peanuts sprinkled on top add more crunch and texture. It’s great for a events. You can make it in advance, pop it in the fridge, and forget about it. To a large bowl, add the peanut butter, cream cheese and confectioners’ sugar and beat with a handheld electric mixer on low to medium-low speed until small, pebble-sized balls form. Add the whipped topping and beat on high speed until smooth, stopping to scrape the bowl as necessary. The mixture is thick and I needed to beat it for about 4 to 5 minutes to get it smooth. Turn out into prepared crust (you don’t need to bake the crust if using storebought; if using this scratch crust bake for 10 minutes). 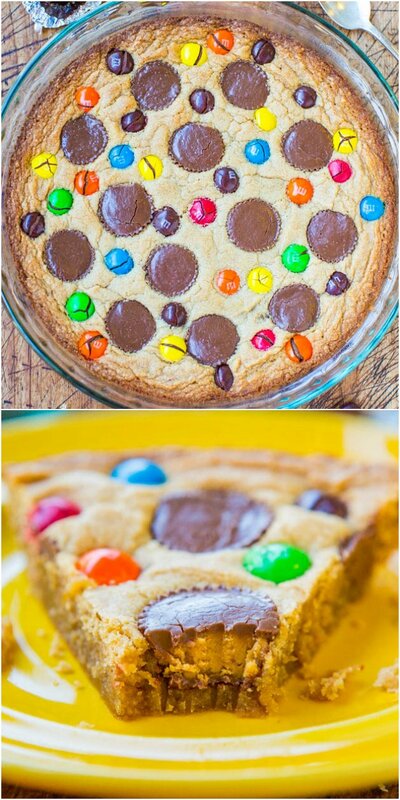 Evenly sprinkle with the peanuts and mini chocolate chips. Cover and refrigerated until set, at least 4 hours (overnight is better). Keep chilled until serving. 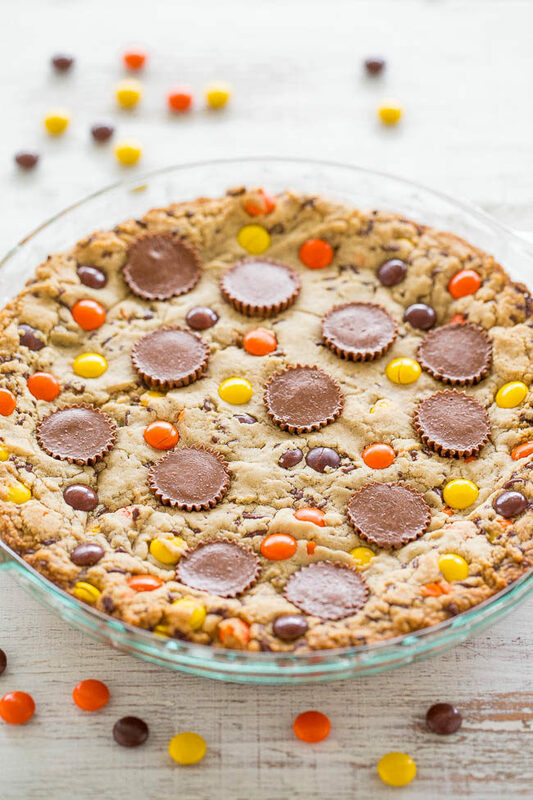 Loaded Peanut Butter Cookie Pie – Peanut butter is used 3 WAYS: In the dough, with peanut butter cups, and Reese’s Pieces! Easy, no mixer, super soft center with chewy edges, and tastes amazing! 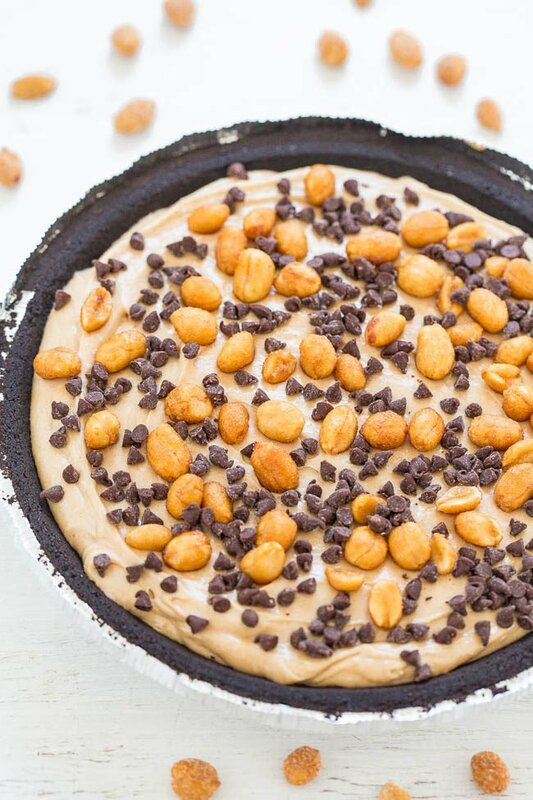 Triple Peanut Butter Cookie Pie – This fast amd easy cookie pie has peanut butter worked in 3 different ways! 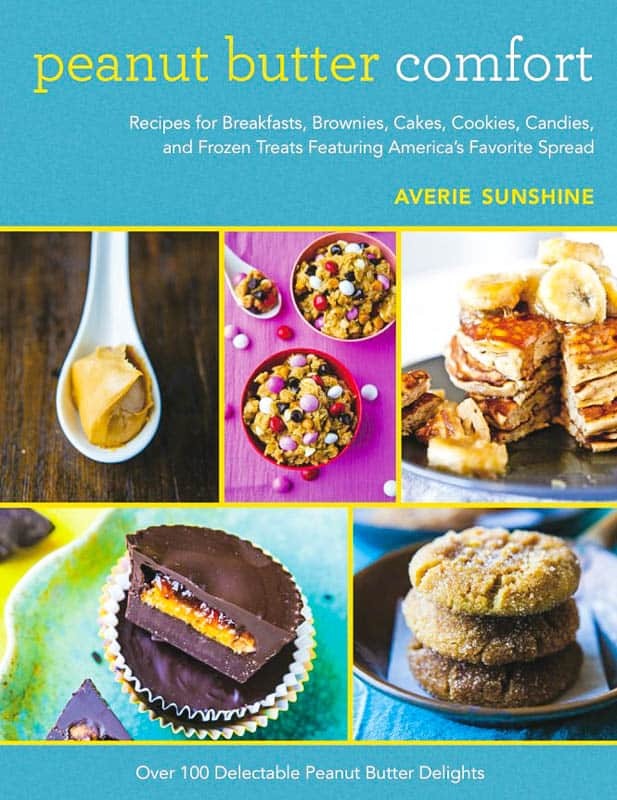 If you’re a peanut butter lover, this is for you! 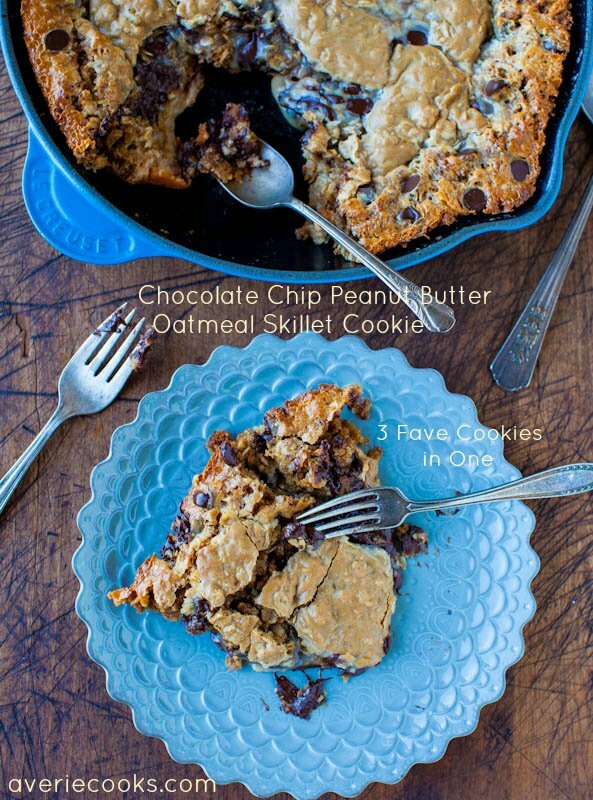 Chocolate Chip Peanut Butter Oatmeal Skillet Cookie – 3 fave cookies combined into 1 giant cookie! So easy & ready in 25 minutes. Pop it in before dinner and enjoy! 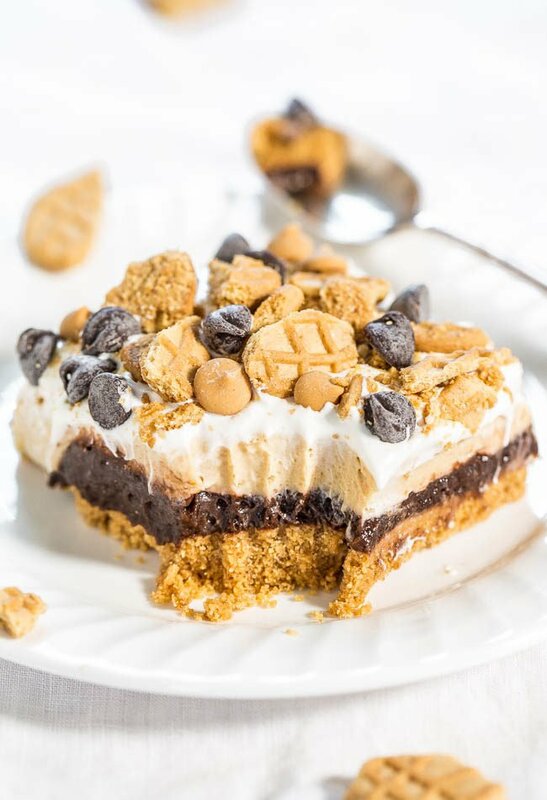 Peanut Butter Smores Cookie Pie – A peanut butter and graham cracker cookie underneath gooey marshmallows and melted chocolate! You don’t need a campfire for these easy and amazing smores! Grab a spoon and dig in! 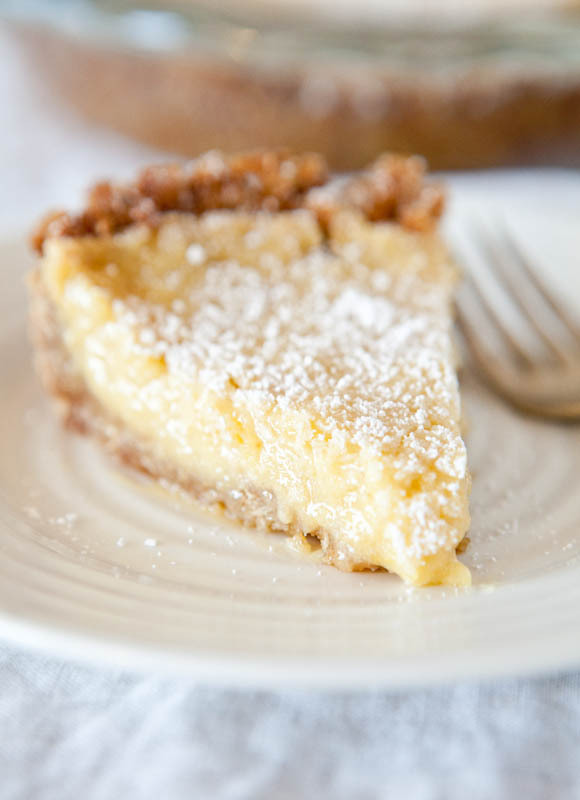 Crack Pie – The infamous pie that lives up to it’s name! Addictive and wonderful! 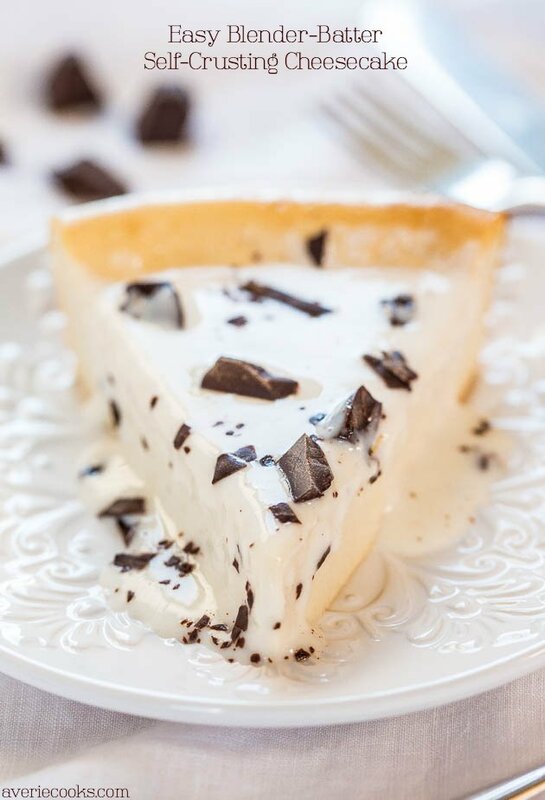 I love no bake pies made with cream cheese and whipped topping–they are a little lighter than cheesecake but still have that flavor. 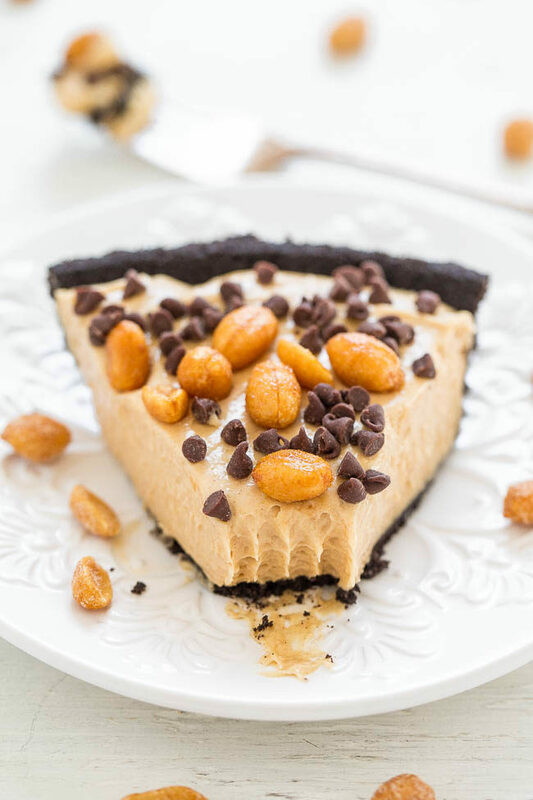 This looks delicious–especially with the peanuts and chips on top! I’m a fan of shortcuts like pre made crusts, rotisserie chicken, and precooked grains! I’d love to make everything from scratch, but life and a lack of time can get in the way. This filling was so smooth and creamy yet light enough…so good! This sounds like a great birthday treat! I agree with Paula–I try to do *more* homemade food rather than pre-packaged (which is why I troll your site!) but I love having a few easy options up my sleeve. Easy options, especially desserts for parties, potlucks, you have to bring a dessert to the kid’s school, etc. are always nice, right! You KNOW i’m all over this. I could eat the ENTIRE thing in ONE SITTING!! OH my god. I feel pretty speechless. I love it!! 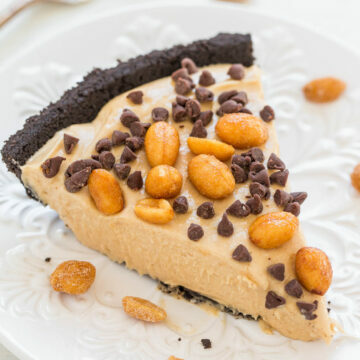 In general I love no-bake pies like this. They feel just kitschy and retro enough to satisfy the nostalgic part of me, but they stand up in the flavor department–they taste delicious. You’ve inspired me with this one for sure. I love the idea of OREO with pb versus just chocolate – a little different. Bring on the Cool Whip and the short ingredient list…not to mention peanut butter! Love all your desserts!